Lose weight and prevent disease -- without dieting! You've tried low-fat, low-carb, and high-protein diets, but you can't seem to keep the weight off. Why? As nutritionist Felicia Drury Kliment explains, all digestive metabolisms are not the same, and your friend's diet miracle could be your diet disaster. 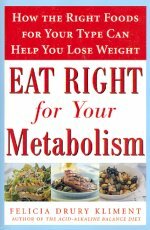 The fact is, when you eat right for your metabolism, your body automatically regulates your food intake.